Is Your Lack of Cash Holding You Back From Your Real Estate Dreams? Don't let the contents of your wallet define your future. Discover the real life strategies that smart investors are using in today's market to invest in real estate with creativity! In The Book on Investing in Real Estate with No (and Low) Money Down, active real estate investor and co-host of the BiggerPockets Podcast, Brandon Turner takes readers past the hype and dives into real life strategies that investors across the world are using to invest in real estate using creativity - instead of their own cash. In This Book, You'll Discover:* The Truth About No Money Down Investing Investing with little to no money down is possible, but it's not about some step by step strategy. It's about a mindset. * Numerous Strategies to Mix and Match Creative investing requires a creative mind, and this book will share numerous examples of creative deal-making. * Attract Private Money, Lenders, and Partners There are millions of millionaires walking the streets. Discover the best way to attract them to you. * The Ugly Side of Creative Investing Learn the downsides to all the strategies mentioned in this book, as well as tips for overcoming those problems. * Get Started with No Money or Experience Looking for your first deal? Learn the best strategies for getting your feet wet without paying thousands! * Wholesaling, Flipping, Rentals, and More! No matter what niche or strategy you plan to use to build your real estate empire, this book can help you proceed. Who is This Book For? The Book Investing in Real Estate with No (and Low) Money Down was written for anyone looking to get more mileage out of their real estate investment strategy. House flippers, landlords, wholesalers, note buyers, private lenders, and more can all benefit from the information provided. No matter what your skill level or experience in real estate has been, The Book on Investing in Real Estate with No (and Low) Money down is for you. What's Different About This Book? 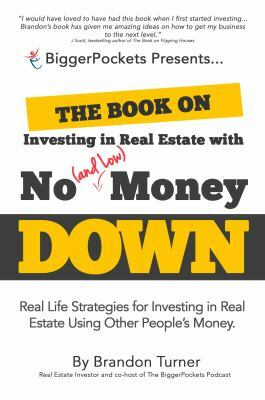 The Book on Investing in Real Estate with No (and Low) Money Down is different because its not about "one right strategy." Instead, the book is a collection of numerous different strategies to help you be able to handle whatever deal comes your way. We believe that The Book will not only help you navigate the world of creative real estate finance, but will help change your entire mindset in how you approach real estate investing in general. How Will This Book Help Me? No matter how much money you have in your checking account, there is always real estate you can't afford. Even the most successful real estate investors use creativity to invest in real estate without using their own cash. This book will provide numerous strategies, tips, and ideas for leveraging other people's money to help you do more deals. New (5115 available) BRAND NEW. Over 1.5 million happy customers. 100% money-back guarantee. Make your purchase count: support Better World Books' worldwide literacy partners.